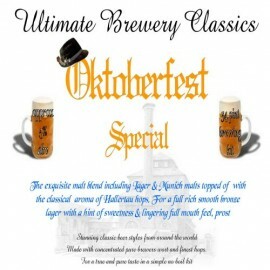 Superb rich and full bodied Oktoberfest beer with rounded smooth and rich full malt flavour. Brewed to 34 pints for a fuller body and increased alcohol to celebrate in style. The exquisite malt blend including Lager & Munich malts perfectly sum up this celebrated beer style that is topped of with the classical aroma of Hallertau hops. Full rich smooth bronze lager with a hint of sweetness & lingering full mouth feel, prost! Makes 34 pints or 19.3 litres.